Chris Genoa, bizarro author of the Eraserhead Press top seller FOOP!, has returned with his long-awaited second novel Lick Your Neighbor. It is basically a very strange retelling of the first Thanksgiving. This is what you should be reading today while waiting for the turkey to cook. 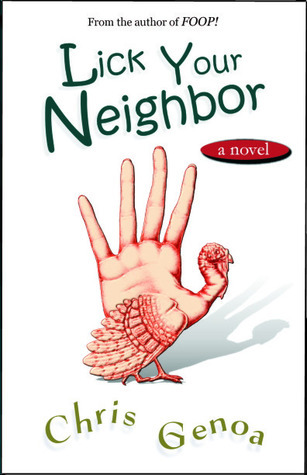 When Dale Alden of the Duxbury Historical Preservation Society awakes on the morning before Thanksgiving, there’s a turkey hanging from a tree in his backyard, a duck hanging from a rope in his fridge, an ill-tempered farmer in his bedroom, cops on his doorstep, and his son’s greasy, drumstick-clutching hand in his face. And that’s all before he leaves for work. Mutant ninjas, a talking whale, kung-fu masters, maniacal Pilgrims and an alcoholic clown populate Chris Genoa’s surreal, darkly comical and unnerving reimagining of the first Thanksgiving. Put down your feathered headdresses, puritan collars and buckled shoes and prepare to get schooled in the alternate history lesson they never mentioned in grade school. This entry was posted on November 25, 2010 at 3:30 am and is filed under Bizarro Books. You can follow any responses to this entry through the RSS 2.0 feed. You can leave a response, or trackback from your own site.